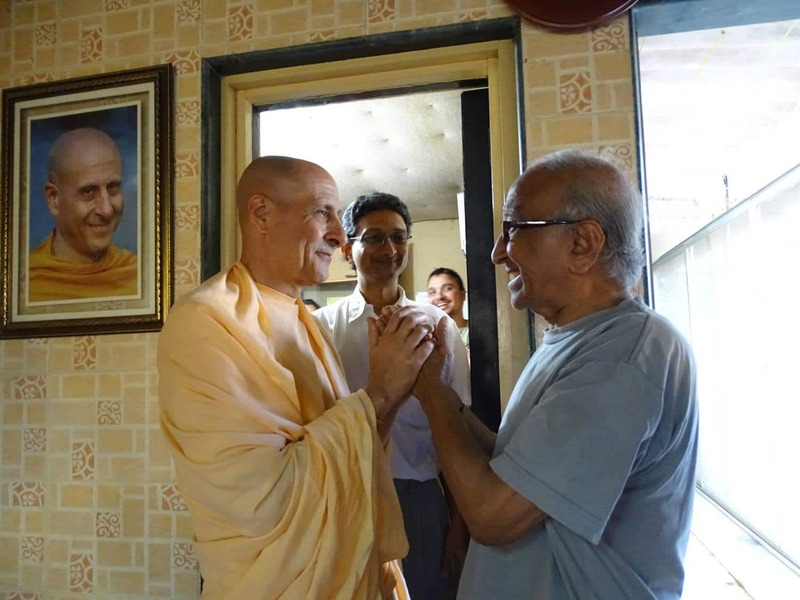 On the afternoon of 4th February, 2016, HH Radhanath Maharaja visited ISKCON desire tree (IDT). He first came to the flat where I do video recordings – I think of it as my digital bhajan kutir. When he saw a picture of Srila Prabhupada in the studio, he immediately said, “This is from New Vrindavan. It was in 1972, Kirtananada Maharaja was near Prabhupada and I was there too, standing where you are.” He pointed to where I was standing. Looking closely at the picture and then at me, he said, “No, I was not that close. I was where Vaishnava Seva Prabhu is.” He pointed to a spot a couple of feet away. Maharaja gazed at the picture for several long moments – it was clear that he was in a different world. As I was observing Maharaja, another similar incident flashed through my mind. A few months ago when I had met Giriraja Maharaja in America, I had given him my book Prabhupada: The moments that made the movement. On seeing some of the pictures of Srila Prabhupada in that book, He too had become momentarily lost in devotional absorption. It struck me that Srila Prabhupada’s disciples have a treasury that we his grand-disciples don’t. They have such rich memories of Prabhupada, something that we can relish only as long as they are still with us on this planet. After that, we will be bereaved of that great treasure of personal memories of the person who has changed the course of Vaishnava history. As we left the flat, Maharaja asked me about my realizations from my US visit. As we had just started speaking, we reached the IDT office, and our discussion was cut short. 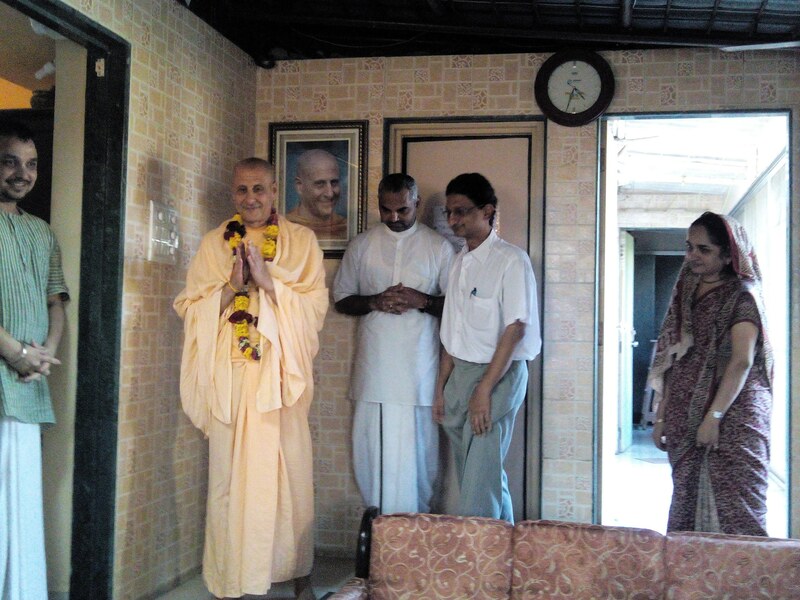 IDT office is actually the same as Vaishnava Seva Prabhu’s home. He has taken two adjacent flats and merged them into an improvised office. He is a respected surgeon, Dr Bimal Shah, specializing in laproscopic surgery and heading the Department of Laproscopic Surgery at the Bhaktivedanta Hospital in Mira Road, Mumbai. His wife Dr Kshama Shah (Kalindi Mataji) is chief anesthesiologist at the same hospital. Both of them stay in just one room and his father stays in another room. He keeps a guest room for visiting devotees, usually those who want to recuperate after treatment at the Bhaktivedanta Hospital. The rest of the home is used as workspace for over a dozen employees. From this inconspicuous base has issued a gigantic digital outreach of Krishna’s message. Iskcondesiretree.com has 23.000 members and over 11,000 unique daily visitors. The reach is spread further through over 70 sites and over 100 apps. From audio.iskcondesiretree.com, 7000 audio files are downloaded daily. And IDT’s youtube channel is viewed for 120,000 minutes daily. Maharaj entered IDT office and sat on a sofa. Vaishnava Seva Prabhu outlined briefly the history of IDT starting with how decades ago he had been doing audio recording of Maharaja’s classes and handling the tape ministry, library and sound system in Radha Gopinath temple. Maharaja nodded and, speaking to everyone, appreciated Vaishnava Seva Prabhu’s commitment and versatility, saying that he is not just a high-class surgeon, but also an architect – he designed and oversaw the building of the Bhaktivedanta Hospital. Maharaja turning to Vaishnava Seva Prabhu said that we discussed what color the building should be and what kind of windows we should have. Maharaja appreciated him, saying that it’s amazing that he is able to do so much in twenty-four hours. While Maharaja’s words were certainly memorable for me, the most revealing and edifying part of his visit was his conversation with Vaishnava Seva P’s father (I will refer to him as Mr Shah). He is afflicted with dementia, and has periods of lucidity that alternate with phases of incoherence. Maharaja’s visit was a period of lucidity, though there were a few moments of incoherence in between. Yet Maharaja treated him with respect and attention throughout. I had known that Maharaja always values relationship more than projects. 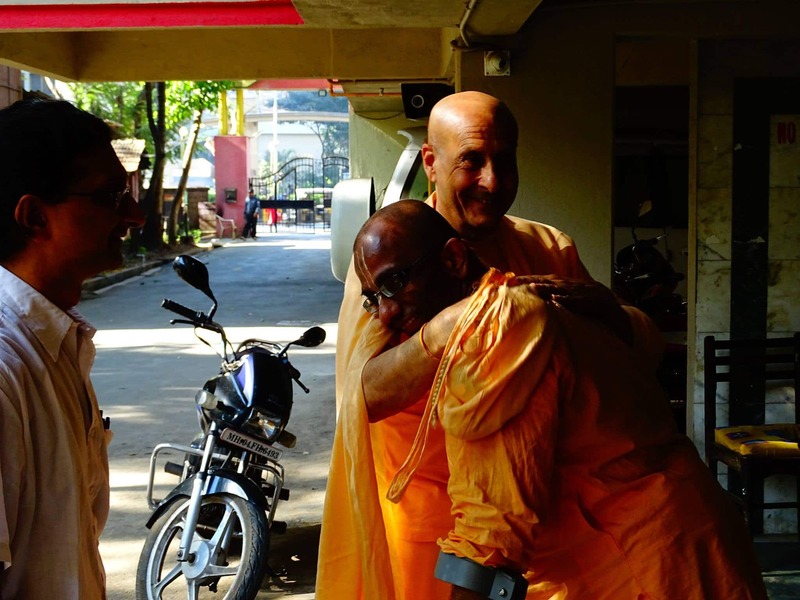 It’s not that he undervalues projects – the many projects that he has inspired are testimony to his commitment to offering doing wonderful projects in Srila Prabhupada’s service. But he keeps relationships at an appropriately high priority. This became evident when he said, “I am proud of your son for the way he is taking care of you.” I found it sobering that Maharaja didn’t say, “I am proud of him for pioneering IDT.” IDT might seem to be a far more special and glorious project than taking care of one’s ailing father, and Maharaja is definitely pleased with the IDT service, as was evident from his earlier talk. But Maharaja’s statements underscored that while doing big things in Krishna’s service, we shouldn’t neglect the ordinary things that define us as human beings and as devotees. Maharaja has won the hearts of thousands, if not millions, all over the world because of his capacity to connect at the level of the heart with people. That is not a skill we get genetically or learn by some self-help training. We can form heart-to-heart connections with others only when we have genuine respect and concern for them. And Maharaja has always had that in abundance, even from his pre-devotional days. I remembered an incident during his spiritual search. A sadhu had served spicy khichadi to Maharaja (then Richard Slavin). Although the chili in it was burning him from within, he not only finished all of that khichadi but also accepted a second helping when offered – just to not hurt the feelings of that sadhu. I also remembered how, during a Pune yatra many years ago, HH Devamrita Maharaja had said, “What amazes me about Radhanatha Maharaja is his ability to maintain so many loving relationships.” I gained a deeper understanding of that appreciation when I meditated how Maharaj had so affectionately and respectfully connected with a person whose affliction would have normally made anything beyond basic greeting difficult. Vaishnavas are desire trees. Advanced Vaishnavas such as Radhanatha Maharaj are like giant desire trees. I felt grateful to have had the opportunity to behold the pastime of a giant desire tree blessing ISKCON desire tree. Thank you for your profuse appreciation, Narayan Acharya Prabhu – happy and honoured to be using my small writing abilities to share the glories of great souls. Thank you Vaishnava Seva prabhu and Kalindi Mataji for this wonderful Opportunity. Jai….Wonderful reminisce, nicely written. These flow of events & everlasting memories can be recollected fondly for many years to come. Blessed to be a part of this project. Jai Srila Prabhupada!!! Jai Gurudev!!! Thank you Prabhuji for such a wonderful article written by you. It took us back to memory lane and wonderful moments with Maharaj. Truly, we all are really very grateful to Vaishnava seva Prabhu and Kalindi Mataji for giving such a wonderful opportunity to serve in IDT. These special moments will never be deleted from our hearts. Also you have captured each and every moment lively in your writings. Dandavat pranams. Jai Srila Prabhupada and Gurudev. I had tears in my eyes reading this article. 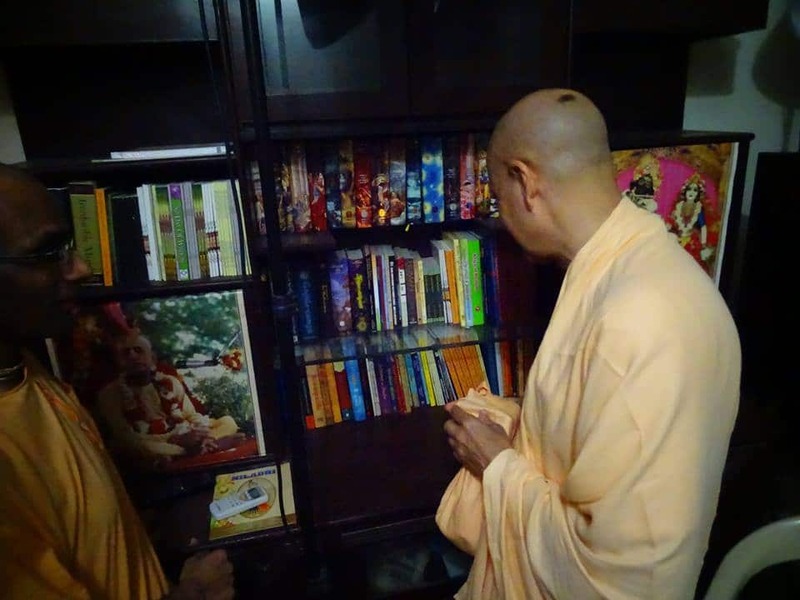 I was literally visualising the whole thing, particularly the office set up and the sofa Maharaj sat on, your room in other flat, the altar in HG Vaishnavseva prabhu’s house, the devotee staff and the computers. This is manifestation of desire of these great devotees HG Vaishnavseva Prabhu and dear sister Kalindi mataji to serev the bigger vaishnava community. You very nicely described Maharaj’s mood and mission, capturing various incidents and particularly his dealing with Shah Uncle. Prabhuji, you have narrated very nicely the big service provided by IDT and I have come across so many devotees in this region and elsewhere who gets benefit from selfless service by IDT team. I feel very grateful to HG Vaishnavseva Prabhu and would like to thank him for engaging me initially in the service of IDT (when it was rgl.ameo.com and rg.com), the technology was not very advanced (& we didn’t have sufficient resources). Vaishnavseva prabhu although a surgeon, his technological mind will learn everything and he will teach us. We would go through long process of getting cassettes from temple, transferring audio into old version of computer via a mixer while hearing it. My wife would assist me in this service while Kishori was in her womb. Then we would upload the lectures from my office converting it in real audio format to save the space but compromising on quality due to space constraint. In those days HG Vaishnavseva Prabhu had released a special CD which contained 188 lectures (SB, sunday feast and festivals class) given at Sri Sri Radha Gopinath temple and it was a big thing having so many lectures in one CD. 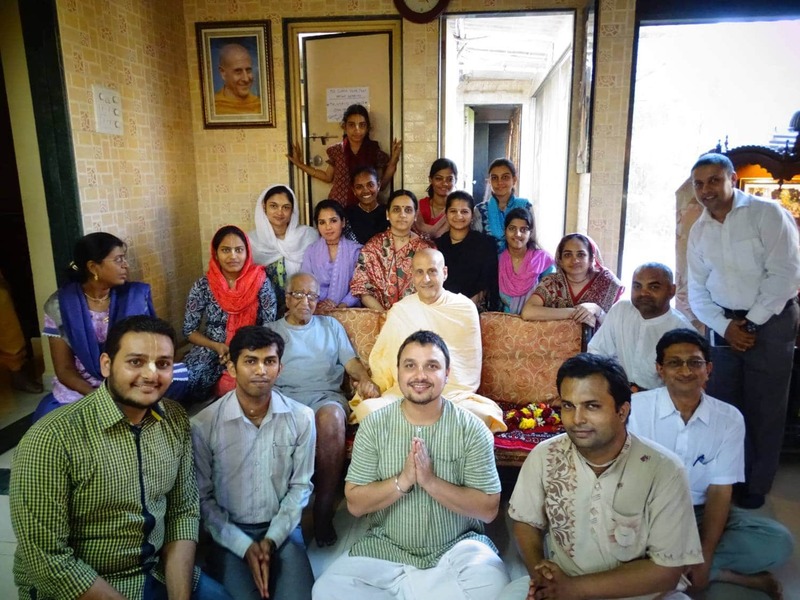 Those were golden moments spent with HG Vaishnavseva Prabhu and Mahaprakash prabhu. Later by will of providence, I relocated in Middle East so couldn’t serve him very actively though try to connect Kishori’s birthday with IDT seva every year, but out of his kindness Vaishnavseva prabhu engages me in some sevas to keep me going and I am grateful for that. Last year on his birthday I wrote my offering which I am reproducing here. Thank you for your kindness upon me as always and your amazing expertise in writing the article dear Chaitanya Charan prabhu. Really sorry for such a long post, please pardon me. Thank you, Rasamrita Prabhu, for sharing these sweet memories and lavish appreciations. THANK U SO MUCH PR. FOR INSIGHT IN LIFE OF GIANT DESIRE TREE. Thank you for sharing this wonderful, instructive and benevolent pastime. It is the best of Maharaj, and the best of those who he has inspired. And of course, it comes as a wonderful narrative from the pen of Chaitanya Charan prabhu. Wonderful and very much required article on the person behind IDT. Vaishnava Seva prabhu by his selfless service is a living example of a true Vaishnava. I think this article should reach, through various means, many more devotees who use IDT but are not aware of the sacrifice of Vaishnava Seva prabhu in maintaining this site. I will circulate this article thru our congregation e mail and request that devotees should try to circulate this article in creative ways to a wider audience of devotees. So sweet – thanks a million for sharing. Thank you so much for the post! I am a cristian but I want to join ISKON some day.